Explore our Australia surf holiday destinations. Location: Southern Hemisphere. Surrounded by the Indian and Pacific oceans. It wasn't until December 1914 that Australian surfing officially began when the Hawaiian Olympic champion, Duke Kahanamoku, re-introduced the sport of surfing to Australia. He was invited to give a surfboard-riding exhibition which saw a 16 year girl, Isabella Letham, invited from a large crowd on the beach at Freshwater, Sydney, and became the first official record of an Australian learning to surf and actually standing up riding waves. After Duke left Australia, Claude West, "the Hawaiian's star pupil" became Australia's first surf champ and ruled as such from 1915 thru 1924. When surfing initially hit the Australian shores it came with the western hang ups about sexes, so boys surfed while the girls caught a tan on the beach. Fortunately, the gender of today’s surf spots is more Hawaiian, with almost equal numbers of men and women in the line–ups. This is largely thanks to women’s surfing turning professional in 1977. However, it wasn’t until the 90’s that all board-riders stood on equal footing. This happened because the world champ at the time, Lisa Anderson, surfed better than almost any male and surf companies finally saw the marketability in women’s surfing. Riding waves fast became a lucrative career prospect, which had surfers doing land-based cross training in the same way golfers have started to do. Seeing the success of this approach Surfing Australia (SA) has just opened the world’s largest surfing sports science institute. Their athletes train hard on land so they can surf easy in the water so you can expect to many more Australian surfers on the world tour in years to come. What's the Surf like in Australia? Surfing is a national past time, even former prime minsters, such as Tony Abbot, are known to drop in on unsuspecting fellow countrymen. Needless to say, the entire country lives and breathes surf culture. Picturesque little towns dot the length of this state’s coastline all of which are all deeply imbedded in the rich surfing history and culture. That said, there is huge expanse of uninhabited beaches where you can be left feeling like the only person on the planet, which opens up plenty of opportunities to enjoy an un-crowded session. Upon your travels in this state be sure to drop into Torquay which is the home of the surf industry where you can get plenty of cut price gear from factory outlets while still enjoying spectacular ocean views. There are waves for surfers of all abilities from beginners to advanced. Even at the big name spots such as Bells (for intermediates) there are milder alternatives such as Winkypop that are a more chilled for beginners. Be sure to bring the wetsuit because the water can be a little cold, especially during winter and the surfers in this neck of the woods are a hardy breed of folk willing to endure tough conditions for the thrill of the perfect wave, of which there are plenty. This is one of the lesser travelled surfing hubs by foreign tourists though it’s a well-known ‘secret’ by the Australians who regularly enjoy empty waves along this rugged coastline. While New South Wales, Queensland and Victoria are teaming with towns and people, the South becomes a lot like the Wild West with very few folk around. As such, it’s wise to travel in a sturdy 4WD to reach the more remote surf breaks, but you will still be rewarded with waves-a-plenty if you’re in regular sedan leaving you to enjoy endless sandy beaches stretch up towards sand dunes that overlook excellent waves. The most frequented Australia surf spots in the South are near Adelaide’s mid-coast which can get blocked from the bigger swells, making it ideal for beginners. If you’re after more meatier fare then travel towards Victor Harbour which has an easy, fun wave at a spot called Middleton, that’s perfectly suited to beginners and Malibu board riders. Plus it there are reefs around this area for the more experienced surfer. You’ll find plenty of crew on these banks but if you’re after untouched waves then travel to the Yorke Peninsula, which offers excellent waves with minimal people. So be sure to pack a crew because there is a genuine shark risk and if you’re really after some old world adventure then take a trip to Kangaroo Island which offers plenty of waves, excellent fishing and beautiful must-visit towns. When you return to the mainland it’s also worth taking a tour through the wine lands on a lay-day for some world class wine tasting that’s sure to take the sting out of not being in the water. If you’re after maximum waves you could easily spend your entire holiday solely in New South Wales. It has more accessible top-notch surf breaks than any other state in Australia, but thanks to it’s sheer size it’s best to divide it into three sections: southern, middle and the north coast. The south end of NSW is ripe with a host of breaks for people of every level though it the water is a little cooler than rest of the state. Since it’s further south it tends to pick up more swell, which 9 times out 10 comes off the Antarctic. Cronulla is a must visit surf spot but the further you move south the less the crowds will be. Ideal for a quick road trip that’s guaranteed to deliver. The middle and capital...Most people coming to Australia will touch in Sydney, which is definitely worth a paddle despite its massive population. There are plenty of nooks and crannies offering surfable options that range from slabs to beach breaks to point breaks that’ll satisfy surfers of all abilities. Yes, it’s crowded on the weekends but Sydney is an expensive city so if you’re free during the week, everyone else will out earning their crust leaving you to enjoy fun waves with minimal people. The northern end...A road trip from Sydney to Bryon Bay is a right of passage for any visiting surfer and home to a great selection of Australia surf camps. First stop north of Sydney should be Treachery, which is a super laid back town with excellent beach break options that fire up on every kind of wind. Next on the list is Crescent Head, which is a slow paced right hand point that’s ideal for surfers of every level. As you travel north you’ll come across plenty of surf-rich towns such as Coffs Harbour and Sawtel before you reach the pinnacle of swell: the Northern Rivers. While Bryon Bay is an excellent and leg burningly long ride, it can be a little soft and more suited to beginners when the swell is small. To get some more serious waves underfoot you can drive 20 minutes to Lennox Head and Ballina which sport a series of roughly 6 right hand point breaks that are all world class. This is arguably one of the best areas to bunker in to because you can enjoy the chilled hippy vibe of a Byron Bay, a town the seems stuck in the glamour of the 1960’s, while taking small day trips to enjoy warm water and picturesque settings ripe with epic waves. It’s a place you’ll never forget, no matter what your ability levels. Taking the reigns off Victoria, Queensland has become the epicentre of Australian surf culture. At it’s southern edge stands the crown jewel of surfing: Snapper Rocks which is an incredibly long sand bottom right hand point break that guarantees leg burning barrels for surfers of all levels. The Gold Coast’s skyscrapers flanking the line-up’s horizon creates a unique juxtaposition of progress and natural beauty. Just mind the crowds because it regularly plays host to arguably the biggest crowd in the world. This puts it firmly on just about every surfer’s bucket list. Just don’t expect to get sore arms from excessive wave catching, well, unless there’s a rip. If you want to slow down the pace a little start moving north. First stop is a Stradbroke island which offer excellent opportunities for surf minus the crowds, especially if you have a 4WD as there are miles of sandy beaches begging you to find the perfect A-frame to indulge in with your friends. Travel further north and you hit the Sunshine Coast which tends to be a little more sheltered from the swell so pack a high volume board, but it is a great place for intermediate to beginner surfers. The jewel in the sunshine coast is Noosa which is yet another incredibly long right hand point break that lights up when the swell is big, both in winter from the southerly fronts and in summer thanks to the cyclone swells. It’s a longboarder’s paradise but offers plenty of stand-up sections for short boarders to enjoy. Crowds can be a factor and the Australia surf camps in the area can be booked out well in advance. You may want to stop travelling north at Noosa because the window for swell begins to tighten, the further north you travel thanks to the Great Barrier Reef blocking any incoming waves. Plus there are plenty of scaly green crocs lurking in the places that the swells don’t reach so the lack of swell is a blessing in disguise. During your lay days you’ll have a wealth of things to enjoy throughout the tropical paradise with everything focusing around surfing, fishing and the native wildlife. This is where the outback meets the beach so to speak because much of the natural environment remains untouched. Much of Australia’s indigenous population has its footings here, which gives this state a more spiritual feel even though it is dotted with just enough small towns needed to keep fuel in your car’s tank. Though it’s an immense tract of coastline not all of it is prone to surf thanks to large barrier-like reefs that block swell. That said, there is still an abundance of easily accessible breaks that offer almost 6,000 kilometres of surfing paradise. So don’t expect to see many people in the line up even though there are waves for people of all abilities. The most notable wave is undoubtedly the glassy A-frame walls of Margaret River on the South West coast, it features on the WCT surf tour and for good reason. Move away from the maddening crowds of this spot and you can get fierce waves such as Tombstones, Gallows and Grunters that are strictly for the more advanced rider. Adding to the allure there are also plenty of big waves haunts that’ll see you breaking out the gun in your quiver if you can get a boat to take you out to them. It’s the big brother state of South Australia that can tear apart the sturdiest 4WD, offer sporadic mobile reception and small town locals with a frontier-like attitudes. It’s got untold secret spots that will reward budding adventurers with untouched reefs, full of both fish and surf. Just be sure to keep your eyes peeled because it was once the sharkiest place in the world, boasting a very healthy population of Great Whites thanks to it’s rich ecosystem. If you’re after quest on the road less travelled this is where you’ll get it in spades. Australia is such a huge country that the temperature of the water and accompanying wind varies to a huge degree. Use this breakdown when planning your Australia surfing holiday to make sure you’re always wearing the right suit for the conditions. The water can warm up on the odd day but it’s wetsuits all year round for this state that has an average temperature of 12ºC. It can get up into the 20’s but can also bottom out to as low as eight degrees. This is similar to Victoria with cool temperatures that do occasionally warm up in the summer, allowing the odd days of boardshorts and a rash vest. However, the average is roughly 17ºC and it can have a huge wind chill factor to contend with so bring the thickest steamer you have to keep warm. In the northern end of this state you’ll find guys skipping wetsuits all year round, as it’s similar to Queensland’s conditions. It might have a few wintery days where a suit is needed or if there is pervasive north wind that blows for a few days. The further south you go the cooler the water gets so you’ll start to need ¾ steamer wetsuit to get through the chill. However, a place such as Sydney has an average water temperature of roughly 20ºC so it never drops too low. Sitting just below the Great Barrier reef the water is balmy all year round with an average of 26º on most days. You’ll only need boardshorts most of the time there is the odd morning in winter where you might need a short arms short legs wetsuit to take off the chill. It’s a state so big it dwarfs most countries so there is a huge variability in the sea temperature. Further south, sees quite low water temperatures in the region of 15 - 20ºC but as you move north these temperatures can move by as much as five degrees. For a more detailed look at when & where to surf in Australia for your surf level use our Surf Trip Finder. Then browse each destination to discover the best selection & lowest prices. 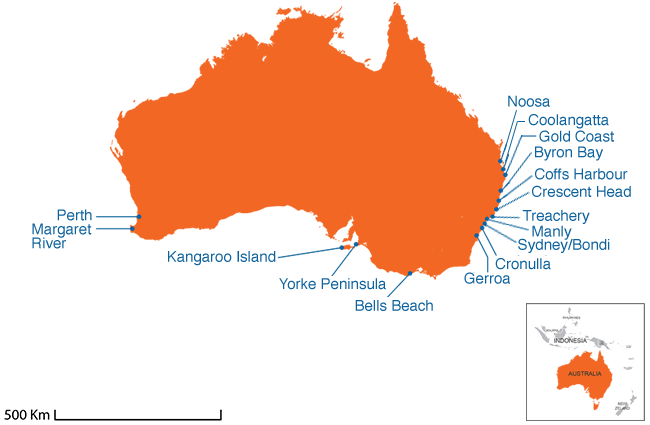 We have a great choice of Australia surf camps, self catering accommodation & surf lessons in Australia's best surf towns. Book your surf holiday online now!